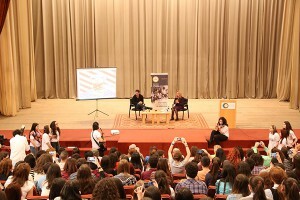 YEREVAN—On April 22, 2015, the American University of Armenia (AUA) hosted Serj Tankian, musician, poet, activist, and lead singer of the rock band System of a Down, for an open dialogue with AUA faculty member Hilda Grigorian. Tankian shared his insights and thoughts on the Armenian Genocide, life, music, passion, following your dreams, and much more. The event was open to the AUA community, with participation from over 1100 students, faculty, staff, and alumni. 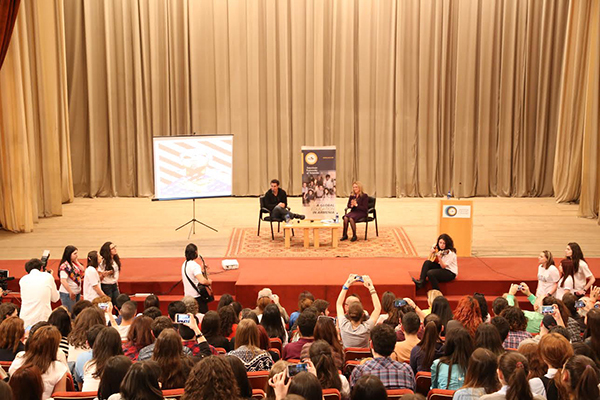 The talk came just two days before the centennial of the Armenian Genocide and many students were curious to hear Tankian’s views on the matter. Born in Beirut but raised in Los Angeles, Tankian now divides his time between New Zealand and California. As a member of the Armenian diaspora, he is well aware of the differences between those in Armenia and those outside of it. “The diaspora community is very well-intentioned but isolated from Armenia. Most diaspora Armenians I speak to have no clue what’s going on here, and that’s a deep disconnect. The real question is, how do we connect these dots?” Tankian credited organizations like AUA and TUMO Center for Creative Technologies for bridging the gap between the diaspora and Armenia, emphasizing that we need to all work together to build up the country. The much-anticipated event also featured an impromptu performance by AUA students of the popular System of a Down song “Aerials.” Tankian was also presented with a certificate of appreciation for his visit to AUA and for his continuous activism in human rights and social justice.